Goat farming in India is a very profitable business with minimum investment. Goat farming can be done in small to large industrial scale. Here is the complete information on starting a goat farming project. Goat farming in India is a well-established, antiquated form of farming especially in places where dry land farming system is practiced. It is generally practiced by farmers who have a very small area of land for farming. Sometimes landless laborers also undertake goat farming since the risk, initial investments etc. are much lower than other forms of farming. Goats are hence rightly called as “poor man’s cow” since it has promises of good return that can serve as investment source. Almost all sections of the society consume goat meat and there is no religious taboo over it. In addition goat meat is lean meat and has lower cholesterol content. 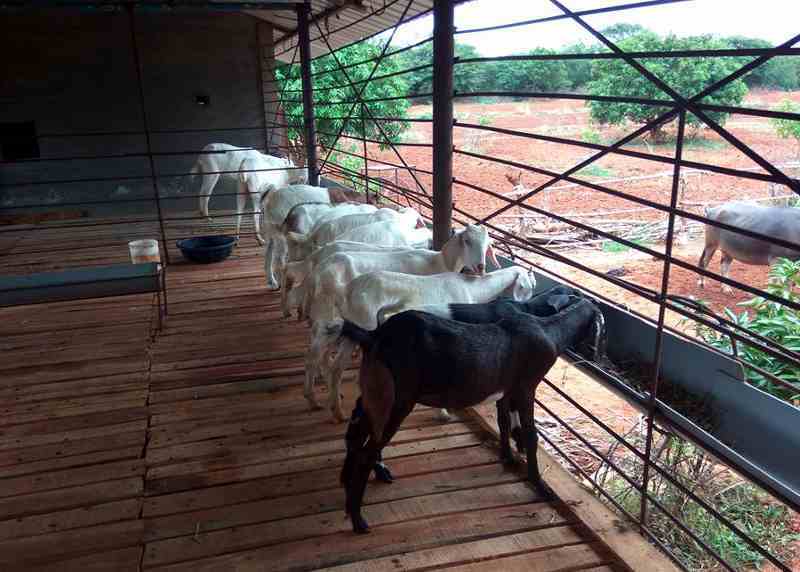 The initial investment required for a goat farm is much low than dairy farming. It is not necessary to start a farm with herd of 6-10 goats. A farm can be started with just one goat and gradually increased to a herd or develop into large commercial units. Goats can tolerate bitter taste to a greater extent than other animals. Hence, they consume almost every type of plants that are not eaten by other animals. Since they are careful eaters they can live in almost all types of climatic conditions. Goat milk contains small fat globules that are easily digestible. Hence goat milk is medically recommended for senior citizens and infants. Goat droppings are rich in phosphorus, nitrogen and potassium. Hence it is excellent organic manure. Goat manure has high demand in organic farming. Generally, goats start milking by the age of 16-17 months. They are productive breeders and give birth to three kids within two years and producing twins is a usual feature. Considering all the above advantages, it can be said that goats ensure good economic returns in a short period of time. Goats must be healthy and lively. However before procuring it is better to check with the local government about regulations. While procuring it is advisable to get two goats. Goats are social animals and need company. They would try to escape if kept in solitary confinement. Hence at least two goats must be kept in enclosures. For milk production, it is not necessary that the does must be impregnated by bucks. Ideally one buck to every 30 does is a healthy ratio for goat farms. Younger goats around eight weeks old are cheaper and friendlier to procure than older goats. However, these younger goats need care for about a year or two. Following this period they can be bred, sold as meat or used for milk production. Goats belonging to breeds like Malabari, Black Bengal, Jamunapuri, Osmanabadi, etc. give very rich milk and good meat. Hence they are reared for both milk and meat purposes. Breeds like Cashmere or Angora are raised for their hair since it is very popular for its use as a fabric. Primary objective of a house is to protect the animal from sun, wind and rain. The house must be built at an elevation so that it does not suffer from problems of water logging. Locally available materials like elephant grass, paddy straw, bamboo, wood, etc. are used for construction of houses. No elaborate housing arrangements are needed for small units. The goat sheds must have a good amount of ventilation. The slope must be arranged such that water can drain away easily and it should be easy to clean the place. In case of group housing a space of 1.8 sq.mt. per doe must be provided while a floor space of 2.4 sq. mt. must be provided for the bucks. An area of 1.8 X 1.8 sq. mt. is sufficient for 10 kids. However, overstocking must be avoided as it results in cramped up spaces and suffocation. Sick animals must be quarantined immediately since diseases spread very easily among goats. Goats are meticulous eaters and can tolerate more amount of bitterness than other animals. Hence, they can thrive on the agricultural by-products, waste and other such feed. In addition they are stronger and hence can withstand all types of weather conditions. Their tongues are adapted for grazing and their upper lip is mobile. Hence they can graze on extremely short grasses, bushes, shrubs and trees. The goats must be provided with leguminous fodder in addition to grains like pulses, wheat, maize, etc. They generally prefer fodder of leguminous crops than straw or maize silage. In addition they need feed composed at least 14-15% protein along with high mineral composition like iodized salt, bone meal, zinc oxide, ferrous carbonate, high grade limestone, copper sulphate and vitamins. The growers are given 100 gm per day of concentrate mixture while adult does and bucks are given concentrate ration of 200-250 grams per day. On an average, each goat consumes 5-7 Kg of green fodder and a liter of water per day. Statistically speaking an acre of fodder is sufficient to feed 35 goats. The new born kid must be fed with colostrum immediately after birth and for upto 5 days thereon. This would help the goat develop better immunity. After the initial five days, the amount of doe’s milk provided to the kid must be 1/10th of the kid’s body weight. Pregnant does must be given a concentrated mixture of 250-300 grams a day. The amount must be reduced gradually from a week before parturition and the mount of fodder must be increased. This facilitates easy delivery. Selecting the right buck and doe is the secret to successful breeding. Goat doe attain maturity between 6-10 months of age. However this also depends on size, body weight and breed. Goat bucks attain maturity after 12 months. It is ideal to have two kidding annually with an interval of 8-9 months for optimal production. 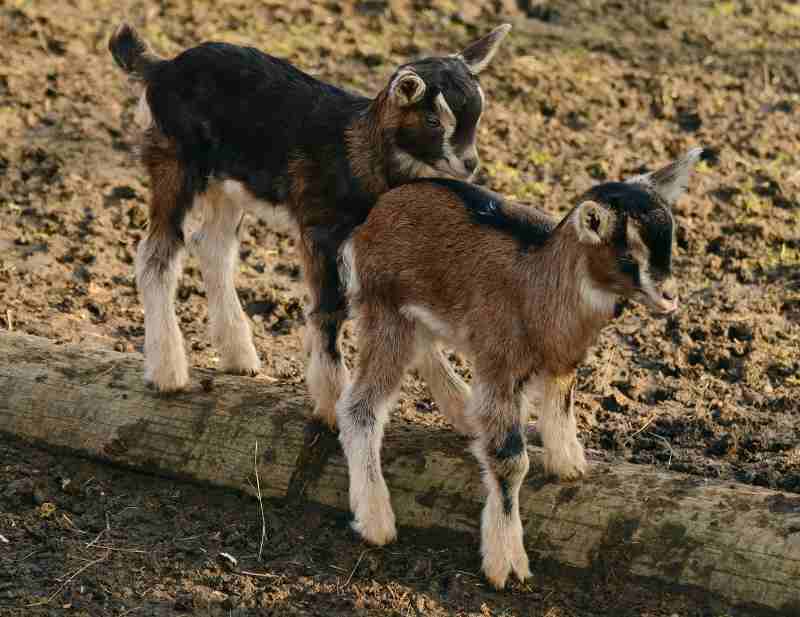 The peak breeding season for goats is during the months of March to May and September to November. The estrous cycle generally occurs every 17-21 days. The heat period lasts for 18-36 hours in a doe. Usually a teaser buck is used to detect the onset of heat in a doe. For increasing the conception rate the doe must meet the buck only after 10-15 hours of the onset of heat. The gestation period lasts for 155 days. While the females can be used for breeding purposes for 5-7 years, males can be used for as long as 8-10 years. Ideal breeding stock would be the ones that are at prime stage of production or are ready to breed. They must be in good health and have a good vigour. Pedigrees are ascertained at the time of purchase. Once purchased, the animals are vaccinated against diseases, especially infectious diseases. The newly purchased stock is kept under observation for 15 days to check for animal behavior, diseases and also to give time to the animals for settling down. They are culled from the breeding stock after attaining 6 years of age and they are replaced with a new stock. Male and female ratio must be maintained at optimum level in the farm. The male bucks must be replaced every 2-3 years to avoid in-breeding. This helps maintain the best performance production. The mucus from the nose and mouth of the newborn kid must be cleaned immediately after its birth. The does must be allowed to lick them so as to develop a mother-kid bond and also for easy identification by the mother in future. The naval cord must be cut 2.5 cm away from the body of the kid. Tincture iodine or other such antibiotic must be applied to prevent infection and naval illness. The udders of the doe must be cleaned and disinfected with antiseptic lotion after delivery. Immediately after birth and for the next 5 days the kid must be given colostrum. However over feeding must be avoided. If more than 2 kids are born then provisions must be made for extra goats. They can be bottle fed formula milk for as long as 2 months. During winter, the kids must be provided with sawdust, straw or gunny bags as bedding materials to protect them from frost. Energy drinks like glucose must be given to the kids during summer to avoid heat stroke. Male kids are generally reared for better meat quality. They are not generally wanted in the breeding flock. Hence they are castrated between the age of 1-2 months. The sheds must be washed thoroughly and disinfected at least once a month. The food and water managers must be cleaned regularly. Goats are prone to endoparasite infection. Hence deworming must be done once in every six months. Kids are dewormed every month while does are dewormed just before breeding. In order to avoid lice, ticks, mites, etc. the animals must be sprayed with ectoparasitic drugs like acaricides regularly. Vaccinations against diseases like goat pox, plague, FMD, etc. must be done periodically. Zoonotic diseases like salmonellosis, brucellosis etc. must be prevented since they are infectious and spread easily. Stray animals must not be allowed to enter the farm to keep infections in check. Sick goats must be isolated as soon as the infection is detected and timely medication must be administered. Choose breeds that are local to the geographical location and best suited to the weather conditions of the place. Animals must be procured from certified and licensed centers. The stock must be such that about 15-20% breeder does can be added every year. The stock must be flexible so that the older animals and poorly performing animals can be replaced without many hassles. Keeping a headcount of more than 150 goats becomes difficult for management. Hence the count must be kept below 150. Flocks must be allowed to graze early in the morning and in late evenings during summer. Grazing must be done near a source of water so that the goats get enough water to drink. During the period of pregnancy, growth, lactation and other such crucial stages, the goat must be provided fresh pastures. The new born kid must be provided with sufficient amount of dry grass and straw for bedding purposes. Cleaning of newborn’s nose and mouth immediately after birth must be conducted properly. The colostrum must be fed within the first half hour of birth. After the first five days, the kids must be gradually separated from the mother and allowed to suckle once in every six hours. This can be continued for the next one week or so and gradually reduced before totally weaning away. Animals of different age groups must be kept in the right flock for their proper care and management. During monsoon, goats are likely to develop foot rot. Hence they must be passed through copper sulphate solution. Once upon a time, goat farming was considered to be a lowly and neglected occupation. However, realizing the benefits of goat milk, meat and other by-products, it is considered as a respected occupation. There are several low investment enterprises among which goat farming tops the list. Goat farming is especially a good business to start with for the unemployed youth whose number is simply increasing by the day. Thank you teaching us am now interested in goat rearing.